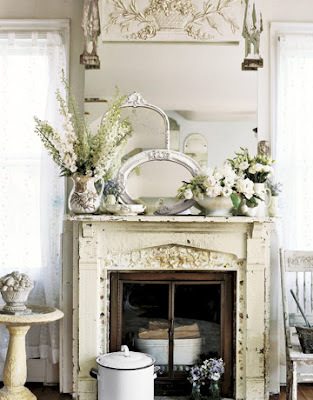 I adore the look of 'white on white' decorating. How about you? It's so simple. So fresh. Such a clean and restful look. None of the rooms in my home are decorated completely in this monochromatic color scheme. My family room is the closest to having this look with it's cream walls and white painted trim, but it's more of a white & black designed room. There are so many shades of white out there. I think that is the secret to using the color successfully. Using all the various shades of white creates the depth and texture that is needed to pull it off. 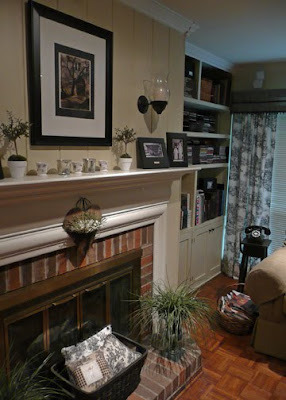 Look at how Jennifer from The Old Painted Cottage did it here with her amazing cottage redo. 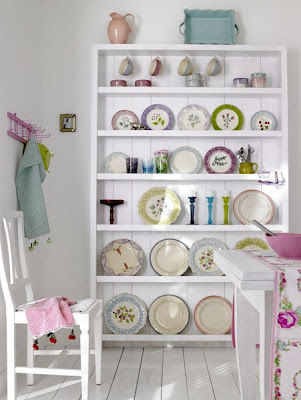 Another great place to see the use of 'white on white' is at Aina's Modern Country blog here. Her Norwegian style decor is so refreshing. The photo above from Seasons For All shows how bright and elegant a 'white on white' decor can make a room. Or maybe you prefer to punch up your white decor with a pop of color like in the photo shown above from Freshome. Do you have a favorite photo of 'White on White'? If so, leave a link to the photo in the comments section on this post. Your photo doesn't have to be limited to home decorating. It can be photos of food or fabric or artwork, etc. Use the mosaic at the top of this post for inspiration. We can all have some fun checking them out. white, white, and more white is my favorite look...i really really want to have my home look like that one day...gorgeous!!! Ready, Set, Here We Go. . .